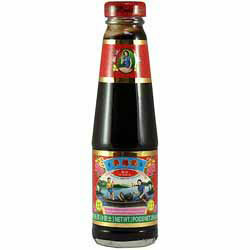 Lee Kum Kee premium all-purpose seasoning sauce is made from the finest oyster extract. Its rich oyster flavour enhances the taste and appearance of any dish. • Mix 450g chicken pieces with 3 tbsp Premium Oyster Flavoured Sauce, 2 tsp corn starch and 1 tsp blended sesame oil. • Saute 3 sliced spring onions in 2 tbsp oil until fragrant. Add the chicken and stir-fry until lightly golden yellow. • Pour in water and cook until sauce thickens. Ingredients: Water, Sugar, Flavour Enhancer E621, Oyster Extracts 9%, Salt, Modified Corn Starch, Wheat Flour, Colour E150c. "Dear Spices of India, Marvellous! Items 'properly' packed (no vast mass of polystyrene to wade through and clean up afterwards) and so prompt! Ordered over the weekend, here on Tuesday."